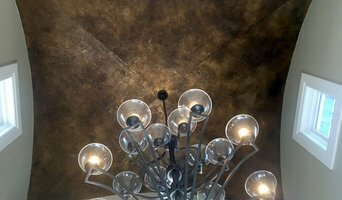 Urban Interior Finish specializes in high end residential and commercial interiors. 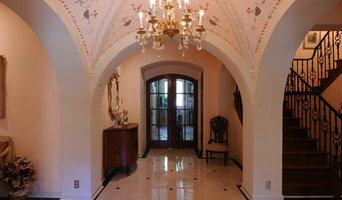 Using a variety of techniques ranging from Metallic finishes, Venetian Plaster, Faux Finishing, stenciling, gilding, screen printing, and custom art work. Rich and luxurious finishes are created on every project. At Artistic Mural Works our mission is to turn your artistic visions into a beautiful living reality. Featuring the work of national renowned artist Norma Ruffinelli. We offer a wide spectrum of services to fulfill the decorative painting needs of our clients. Whether it is a Creative Mural for a Restaurant, a Trompe L’oeil for a Building lobby, Corporate suite, Hospitals, Schools or a Specialty Finish for a Private Residence, we can accommodate virtually any project. Norma is a passionate Artist painter. 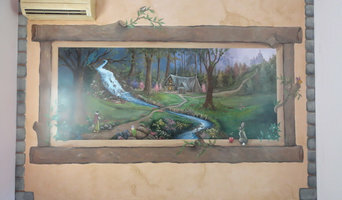 She has been working as a muralist for over twenty years, Her style is detailed and realistic. clients always find her work to be of superb quality and all projects always are finished on schedule. Artistic Mural Works has gained the respect and admiration of its clients due to the sincere interest we demonstrate by our reliability and promptness. Our reputation for superlative work in creating elegant decorative fine art and murals of the highest visual and material quality is the primary factor in our success. At Artistic Mural Works, the satisfaction of our clients is our principal concern. We believe it is essential to work closely with the client from the first consultation all the way through to final completion. By early involvement in the conceptual phase of a project, we can explore all design possibilities and assist in obtaining the best balance of aesthetics and personal style. From the beginning until the end of a project our purpose is to provide your home or business with the most exquisite and unique look that would last for many years. 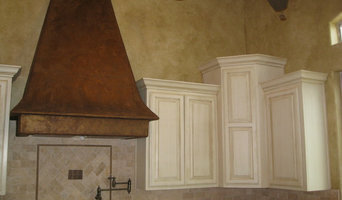 Vigini Paint and Design has embellished Texas homes with hand painted finishes since 1998. We have gained the respect and admiration from our clients who appreciate classically trained artists with knowledge of modern design trends and materials. We pride ourselves in promptness, reliability, integrity and talent. Our showroom in downtown San Antonio is open by appointment for clients to view the numerous options they have for their dream environment. Whether is be a mural, furniture refinishing, gilding, cabinetry or molding finishes, simple wall glazing, we can do it all and have for more than a combined 50 years in the field. The primary factor in our success and longevity is our passion, talent and customer service, working with clients and blue prints sometimes 2 years before building begins. We can show you ways to save money on paint and design and attain the desired finishes for your custom space. With our numerous designs, we have created a line of stencils and custom murals, or giclee, available for sale on our website. Our giclee can be hand finished to achieve a unique look for the intended space. Our work has been featured in Veranda Magazine, Urban Home, Traditional Building Magazine, as well as the in the Institute of Texas Culture, and most recently in an Oscar winning short documentary on Vermeer, Tim's Vermeer. Call us today and let's get started on your dream project! Lisa Moon and her team create custom wall finishes, mural artistry, and fine art installations for homes and businesses. 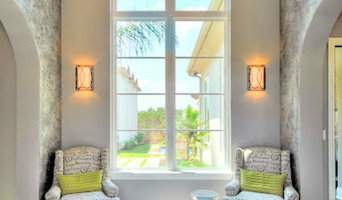 We work closely with top interior designers and custom home builders. Our clients call on us to bring creativity, sophistication and delight to their personal spaces. Designs Faux You has been creating wonderful custom wall finishes, furniture finishes, designer cabinetry finishes for many years. Each designed specifically for you. We assist home-owners, businesses, builders, designers and decorators with their special projects. Our finishes have been featured in several Tour of Homes. When you are looking for specialty, custom finishes, faux painters, faux finishers in Kerrville, TX, DESIGNS FAUX YOU is all you need. Carver Road is a stone carving, sculpture and fine stone masonry company. We offer custom designing, and original, one-of-a-kind artwork. Christina Eadie, master of glass, has worked with the medium for more than 30 years. Accents In Glass serves as a supplier, a gallery, and also a classroom, where glass artists can stock up on materials or improve their skills. Courses are available in glass fusing and stained glass, where students of all skill levels can craft beautiful, panels, bowls, and little glass candies to teach food thieves a lesson. Here at Accents in Glass, we focus on creating unique and innovative products, providing competitive pricing, creating enjoyable and interactive classroom environments, and maintaining satisfied clients. We are national award winning artists and decorators with a unique eye, 20+ years experience in plaster work, faux finishing, and staging. We specialize in non-traditional interior elements: marble walls, brick or stone accents, plaster, reclaimed wood. this combined with our staging expertise we can transform the look of your home for a fraction of the cost to renovate. We fabricate all things metal. We are Autumn and Simon Saleh husband wife artists. Both of us graduated with sculpture degrees from the University of Texas system. We do fine art and functional designed home accessories and accents from your driveway gate to your fireplace and outdoor contemporary sculpture. Emily Magone, an artist from the beautiful and isolated Kootenai Valley in NW Montana, has recently returned to the US from the UK to create from her new studio in San Antonio, Texas. She travels the world, seeking epic and everyday natural beauty. Self-taught and with her Irish grandmother's early influence, Emily seeks to communicate the solace, calm and intensity felt when listening to the sounds the earth makes - without the interruption of man-made noise. Emily has dabbled in many mediums, but her true love is acrylic. She thrives on discovering new surface materials and allowing the pigments and mediums to behave organically; letting the materials thrive to create a piece that has been brought to existence by the nature of its components working with her vision and memories. Through a mixture of wet into wet pigments, dry brushing and impasto, she creates work that emanates the constant soothing yet powerful energy of our natural world. Emily has received multiple awards, and has had her work featured at Kew Royal Botanical Gardens, VIDA, Minted and The Unity Closet as well as on several blogs including Arts Business Institute, Inner Moonlight Designs and Women in Art 278. Her work was also featured on DIY SOS: the big build on the BBC and lives in private collections all over the world. Emily wishes to remind viewers of her art of the connection that we all have to the earth and to all elements of the universe. All information and artwork may be viewed at www.emilymagone.com. I create mosaics using a variety of material and onto many different surfaces. I use materials and methods both ancient and modern that are appropriate for the physical conditions it will encounter. I am an independent artist and designer. My artwork is public mosaic tile projects, architectural details and assemblage. My design work is from basic remodel consulting to specific custom projects.